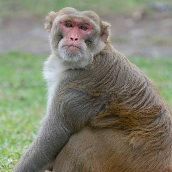 GigaDB Dataset - DOI 10.5524/100002 - Genomic data from the Chinese Rhesus macaque (Macaca mulatta lasiota). The Chinese rhesus macaque (Macaca mulatta lasiota) is a subspecies of rhesus macaques that mainly resides in western and central China. Due to their anatomical and physiological similarity with human beings, macaques are a common laboratory model. Also, as several macaques species have been sequenced, such as the Indian rhesus macaque and the crab-eating macaque, examination of the Chinese rhesus macaque (CR) genome offers interesting insights into the entire Macaca genus. The DNA sample for data sequencing and analyses was obtained from a five-year old female CR from southwestern China. The genome was sequenced on the IlluminaGAIIx platform, from which 142-Gb of high-quality sequence, representing 47-fold genome coverage for CR. The total size of the assembled CR genome was about 2.84 Gb, providing 47-fold on average. Scaffolds were assigned to the chromosomes according to the synteny displayed with the Indian rhesus macaque and human genome sequences. About 97% of the CR scaffolds could be placed onto chromosomes.